IT might have looked like a dull race on television, but the British Grand Prix was a wonderful race for those who struggled through a hell of mud and traffic jams and got to see it themselves. The British are a funny race and they pull together in times of crisis like no other nation. They may not plan very well in advance but when their backs are to the wall they muddle through with a resigned "Oh well, it could be worse" and an engaging sense of unity. Those who did make it to Silverstone were rewarded with an enthralling race, with battles going on right down through the order. David Coulthard pulled off a wonderful move and drove around the outside of Rubens Barrichello at Stowe Corner to take the lead. And the fans cheered merrily when Jenson Button came home in fifth place to score points for the second time in his four-race Formula 1 career. "He's going to be a star," said Sir Frank Williams. "He drove brilliantly today." But the exhilaration of Sunday was not matched on the days leading up to the race as Silverstone's good name was dragged through the mud - quite literally. Out in the public car parks hippos were rolling around happily in the mud baths. A man in a bobble-hat and a JPS Lotus jacket called Noah was building a boat. The 2000 British Grand Prix will not be remembered as one of those romantic Grands Prix where the film starlets and princes tripped around the paddock. The King of Spain did turn up on Saturday and spent his time hiding under an umbrella. His security men got wet. Many thousands of words appeared in the British newspapers about Silverstone's disastrous weekend but mud still cannot keep up with good old fashioned dirt. Jenson Button recently-appointed ex-girlfriend still got more column inches. What happened on the race track in qualifying was quite entertaining but the focus of the weekend was on the car parks rather than the circuit. The days leading up to the race were miserably wet and on Friday afternoon the circuit announced that it would be closing the public car parks on Saturday because it wanted to preserve them for race day. An army of workmen arrived and dumped truckloads of stone into the mud to try to create a hard surface. The comedy reached absurd proportions when a Land Rover sent out to drag David Coulthard's McLaren off the grass beside the track got stuck itself and a red flag had to be shown. It was still raining on Saturday morning but things then began to dry out, though when qualifying began the skies were overcast and rain was threatening. The few people who had managed to get through the countryside were dotted hither and thither in the grandstands but they were treated to an exciting session as the track went quicker and quicker. As almost always happens in these circumstances Rubens Barrichello emerged ahead, to take his third pole position. It was a similar story on both previous occasions. "I like driving in these conditions," he said. "I did not know what to expect but the team did a good job with my car. I know the track very well and I pushed right to the very limit. I went out early because I thought it might rain and that is why I went out early again for my second run at a different time to the others." It was the right thing to do because in the closing minutes when everyone else was going for it, several drivers were under instruction to put it on pole or bring their car back on a truck and they obeyed team orders. There were yellow flags here and there. Michael Schumacher ended up fifth on the grid, admitting that the team had made a mistake on set-up for the conditions and that he too had made mistakes on his final flying laps. It was a sign of the imperfect nature of activities at Silverstone on Saturday. Sharing the front row of the grid with Rubens was the canary yellow Jordan of Heinz-Harald Frentzen, who was celebrating the team's 150th Grand Prix start. "I didn't expect to be on the front row," said HH, "but we seized the opportunity and did a very good job. The Jordan was clearly quite competitive but Jarno Trulli ended up 11th, getting stuck in traffic on his two final last-minute dashes. In frustration he went off. Mika Hakkinen ended up in third position and admitted that he was not really happy with the handling of his car in the circumstances. "Having said that, without the yellow flags caused by Trulli's spin I still probably would have got pole," he said. He was probably right. Lining up alongside him was his McLaren team-mate David Coulthard who reckoned he would have done better but for the last-minute rush. "It's just impossible to guess what traffic will be like," he said, sounding like a Northamptonshire policeman. "Considering that I was held up by a Jordan and a Williams, fourth place is not bad." The big news for the British fans was that sixth on the grid was none other than Jenson Button - F1 sensation and, according to the newspapers, a man whose career is beginning to look like that of The Spice Girls. Button had blown away Ralf Schumacher for the second time in four races. Once again Button grabbed the time in the face of adversity, having done only four laps in the morning sessions. "My day had been pretty terrible so far," he joked after the session. "I made a mistake this morning and ended up in the gravel and then Eddie Irvine ended up there too, damaging my car. We knew it was going to be very difficult to do a time at the end of the session but we were able to go sixth fastest." The Button bashers stayed quiet. Very quiet. The star continues to rise. Gerhard Berger made an important point. "So far he has only been to circuits he did not know and it takes time to learn any circuit. It is difficult to be at your best. But Silverstone is different for Jenson. He knows the circuit." For Button it was the ultimate dream come true. A year earlier he had watched the race as one of the crowd down at Stowe Corner. He never dreamed what would happen in 12 months. Ralf Schumacher was seventh on the grid and not very happy to be beaten by Button again. "I expected more," he said. "I felt quite comfortable but I couldn't manage to optimize on the last lap." "He overcooked it a bit on the second run," said Patrick Head. Eighth on the grid was another small surprise in the form of Jos Verstappen's Arrows. It was a good effort and a few hundredths of a second slower than Button's sixth place. Jos was going for it one last time when he went flying off the track. Pedro de la Rosa was less impressed with his 19th on the grid, having made a bad mistake on his fastest lap. "The car is fine," he said. "It was just a matter of getting a clear lap at the end and I didn't manage to do it." Eddie Irvine was ninth on the grid in his Jaguar and before the mud problems and Button's girlfriend, Jaguar was the talk of the paddock thanks to a new motorhome topped with a silver leaping cat. A monument to good taste it was not but I am sure tomatoes will grow well in the greenhouse when we finally get to some hot and sunny races. Irvine said that his car felt pretty good and that if he had been two-tenths quicker he would have been sixth. "I think we came out OK today," he said. "It could have been better but it could have been a lot worse with the weather playing such a big role." Johnny Herbert was down in 14th and that was not really a good indication of what he might have done. But the time on the board is the only one that matters. Johnny had troubles with yellow flags and had to scrap his final flying lap. Jacques Villeneuve was 10th in his BAR-Honda and for a long time he looked like a man who might even be able to take pole position. The new Honda has a lot more power than the first version and Jacques was using softer tires. In the end Jacques made a mistake on one lap and then ran into the yellow flags on his last ditch run. Ricardo Zonta was down in 16th place and could be forgiven for not having quite the same confidence in his machinery than other drivers, given his accident the other day in testing at Silverstone when he went over the wall at Stowe Corner. Benetton was in a mess again with Giancarlo Fisichella in 12th position and Alexander Wurz was a miserable 20th. "I have been happy with the car all weekend," said the Italian, "and I felt we were really competitive but a combination of mistakes and traffic meant that we didn't manage to fulfil our potential." Wurz spent the session in the spare car and said he was "quite comfortable" but was another to blame the yellow flags. It was not a great day for the Sauber team with Pedro Diniz 13th and Mika Salo's 17th. The drivers both complained that they had struggled to find a good set-up. The Prost team again failed to startle although Jean Alesi (always a demon in the wet) impressed everyone with some really quick laps when the track was still damp. He ended up 15th and the team was not disappointed given the fact that they had done no dry testing laps at Silverstone in recent months. Nick Heidfeld looked a lot less confident than Alesi and ended up 17th, suffering an engine blow-up at the end of his quickest run. Down at the back were the two Minardis with Marc Gene outqualifying Gaston Mazzacane. There were no surprises there. ON Sunday morning the rains had stopped but all across Northamptonshire and away into Oxfordshire and Buckinghamshire the countryside was wreathed in a ghoulish white fog. The famous helicoptering vicar of Silverstone was grounded and forced to rush from church to church on the back of an RAC motorcycle. The jet set was grounded, drinking cups of coffee in soggy fields while they waited for the fog to clear. The Easter Bunny was run over by the last of the early risers, rushing in before every road and every lane became clogged with cars. At 09:20 the Northamptonshire police put out a press release telling people to stay at home. The mud bogs that had once been car parks had reduced the traffic flow to such an extent that queues were solid back to the M40 (15 miles) and to the M1 (10 miles). The police reckoned that those at the back of the queues would not get to the circuit until after the race had started. It was a total, unadulterated, 24-carat, 110% shambles. "With all due respect to Britain and England," said a hardened and mud-spattered international hack in the press room on Sunday morning, "this has been a long weekend." The morning warm-up, scheduled for 08:30 could not take place until 10:10 because no safety helicopter could fly in the fog. The session proved little. Coulthard was fastest with Pedro de la Rosa second quickest and Ralf Schumacher third. The presence of Mazzacane in eighth place suggested that the times did not really prove a great deal. For the rest of the morning everyone listened to stories of horror as survivors of the lanes came struggling having taken three hours to cover 15 miles or having been forced to walk it. The grandstands were full and the sun was out by the time the cars lined up for the start. There were still people arriving but the show must go on. When the five red lights went out Barrichello jumped into the lead. Frentzen too got away well but the real action was going on further back. Jacques Villeneuve made another incredible start. He went left between Irvine and Verstappen, straightened up and was then able to drag past Ralf Schumacher's Williams. At the same time Michael Schumacher was running into trouble. "I had the option to go to the middle," Michael said, "but there were too many cars and nobody seemed to be opening any doors. So I took the other option and went on the grass. It should have worked, but after so much rain in the past days the grass was so wet that I found myself sitting there and going nowhere with the wheels spinning. I lost the momentum. Button went past me on the inside, and then it was Villeneuve passing me on the outside." Michael managed to get into the first corner ahead of Ralf but the pair then became embroiled in a very hairy battle. At Bridge Corner, Michael lifted off for his brother. It was either than or a collision. "He seemed to be very keen to close the door," Michael said. "I didn't want to risk having an 'off' with my brother and I decided that my time would come." The problem was that while Ralf was able to blast past Villeneuve at Stowe on the second lap, Michael was trapped behind the BAR-Honda. It was quick on the straights. And so Michael Schumacher was negated. The race was between Barrichello, Frentzen, the two McLarens and the two Williams-BMWs. The six cars circulated in close order for most of the first part of the race, while the gap back to Villeneuve grew and grew. Jos Verstappen was able to hook on to this battle in his Arrows. Nothing really changed until lap 24 when we discovered that Frentzen and the Williams-BMW were on a one-stop strategy. Frentzen was in and out of the pits in time to slot into seventh (behind the Villeneuve and Schumacher dice, Verstappen having retired) while Ralf appeared behind him. On the next lap Button stopped. His pit stop was a fraction slower than Ralf had managed, with a wheel nut problem costing a second and a half. It was enough to drop the youngster behind his team mate, despite the fact that the Williams team also made a quickfire front wing change to Ralf's car in addition to changing the tires and filling up the tank. The stops left Barrichello and the two McLarens alone at the front. On lap 30 Barrichello was slow out of Chapel Curve. "I started to feel there was something wrong with the car," he said. "I began to have problems with the clutch and the throttle." On the run down Hangar Straight Coulthard drew level with the Ferrari, but the Brazilian had the inside line for Stowe. Coulthard decided that he was going around the outside. "Remembering Nigel Mansell's move on Nelson Piquet [in 1987], I thought I would give that a try," he said. "It held together." David was ahead and he immediately began to pull out a lead. Hakkinen had been struggling with handling and pitted. Two laps later Coulthard came in and Barrichello was back in the lead again as Villeneuve had also stopped. Michael Schumacher was finally free to put in some quick laps and try to get enough time to be ahead of Villeneuve when the stops were over. While this was happening Barrichello's race had ended. On lap 35 he spun off. "I spun because of the erratic behavior of the engine," he said. 'It almost died before a corner and then the power came in again suddenly." Barrichello decided to pit but the team was not ready. It did not matter because the hydraulic systems were failing and so he was without a clutch and could not restart. "I am very sad," he admitted. With Barrichello out of the way and Michael Schumacher pitting a few laps later, Frentzen was left in the lead but we knew he had to stop again so all eyes were on Coulthard. Hakkinen's stop had been longer because the team decided to make a small change and so he was running behind the two Williams-BMWs, although he knew that both would stop again. There were no strategic surprises and so by lap 48 the McLarens were running 1-2, or rather 2-1 as Coulthard was ahead by around 11 seconds. "I developed a small gearbox problem," Coulthard said. "I didn't need that. I am thankful it held together." In the closing laps Hakkinen rushed up behind him. "I think with more rubber on it the track had better grip," he explained. "I was getting a better balance all the time. The engineers made a small change during the pit stop--and that made everything look different." David finished 1.4secs ahead and he was delighted. 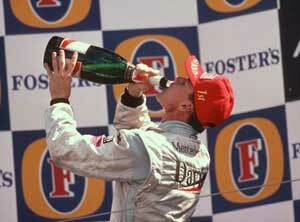 Now he is ahead of Hakkinen in the World Championship so anything can happen. Hakkinen was not pleased but he had been struggling all weekend. Schumacher's strategy was such that he was able to pass Frentzen and the two Williams-BMWs when they stopped for a second time and so he finished third. It was a good result. Early on when he was stuck behind Villeneuve, Michael's only consolation was that Rubens was ahead and would take points away from the McLarens. To have recovered to finish third was a great effort. Frentzen went out with a gearbox failure in the closing laps and so Ralf Schumacher ended up in fourth place after an impressively aggressive drive but his achievement was somewhat overshadowed by another fine showing from Button. To have achieved what he achieved after only four Grands Prix was really impressive. "It was amazing for me to stay with the McLarens and push Mika until he made a mistake," he admitted. "I am learning on every lap of every race and being behind Mika and watching him in action was very good." Towards the end of the race Button suffered a broken exhaust which meant he had trouble hearing his radio messages but he was delighted to take fifth. "You've got to get points when you can," he said. "It is great to finish in the points when no-one apart for Heinz-Harald went off. It's a great feeling." The top six was completed by Trulli who ran a very similar strategy to Michael Schumacher and was able to get the better of Villeneuve in the closing laps, when the Canadian began to struggle with a gear which was jumping out. The gearbox put Jacques out with four laps to go. His BAR team mate Zonta ruined his race when he spun off at Stowe on lap 37. The rest of the field was pretty much irrelevant in the overall scheme of things but Fisichella came home seventh for Benetton, being lapped as the leaders were on their very last lap. This was a good effort, helped by the fact that the team decided to go for a two-stop strategy with an early first stop. It was a strategy to give the drivers as much running on a clear track as was possible. Alex Wurz used the same strategy to good effect and ended up in ninth place at the finish. The only other driver to go for the same strategy was Salo and he was eighth, underlining that a bit of clear track was a lot better than running in a perpetual traffic jam. Salo's Sauber team mate Pedro Diniz did not have a good time in the early laps, dropping from 13th on the grid to 16th at the end of the first lap and 19th by the end of the second lap. He then kept going and was rather difficult to pass because he lost his rear-view mirror early on. He finished 11th. Alesi finished 10th after a long battle with Diniz and Herbert. "The car was not perfect," he said, "but at least it ran consistently all the way and for us that was a first." One has to take things in order. Nick Heidfeld lost three places on the first lap and then trolled around in the midfield until he went out with an engine failure. Jaguar Racing had most of the trackside signage around the circuit which was just as well as the cars rarely appeared in front of the TV cameras. They finished 12th and 13th and everyone talked about the future - which is usually a sign that things in the present tense are pretty bad. Minardi got both cars home as well in 14th and 15th places which was about as much as the little Italian team could have hoped for. Tom Walkinshaw was probably hoping for more than he got from the Arrows team. Verstappen went out with electronics problems after 22 laps after trying to join in with the Villeneuve and M Schumacher battle. Pedro de la Rosa went out with similar problems after 27 laps. Still, if things looked glum for Tom, it is perhaps worth remembering that things can always get worse. He used to be president of the British Racing Drivers' Club (BRDC), which is responsible for the administration of Silverstone, and if he kept that role he would have had a very miserable weekend.